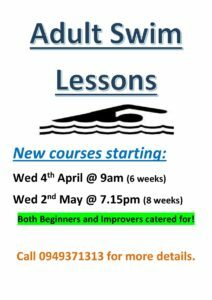 We are now taking bookings for our 9 week Swim Development Programme. 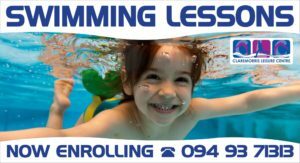 Please be advised, that there will be a Grade A Swimming Gala hosted in the Leisure Centre on Sunday 18th March. 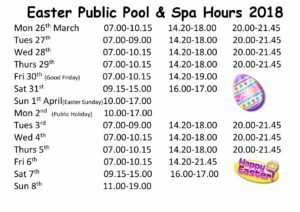 The Pool Hall will be CLOSED to all users until 4.15pm. The Gym will be open as normal. All are welcome to view the competition & show your support. We will be CLOSED tomorrow for St Patricks Day. We wish everybody a very happy St Patricks Day.